Umag is a coastal city located in Istria,Croatia, and it is known to be the westernmost place in Croatia, around 10 km away from the Slovenian border. Umag is, with its riviera, around 20 km long and it is a popular tourist destination in Croatia. If you are flying to Croatia, the closest city with an airport is Pula, located around 80 km south of the town, and after you’ve arrived you can take a bus or rent a car to get to Umag. Another option, even closer than Pula airport is to fly to Trieste in Italy, around 50 km away, and you can take a direct bus to get to Umag from there, making it well connected to Europe. Umag was founded in ancient times, with people coming to an island that later grow to be a peninsula. Istria was ruled by different empires, and therefore so was Umag, who was made into a military base for Istria and North Adriatic by the Roman empire because of its good location. The city is characterized by narrow, cobbbled streets in the center, and the coastline that abounds with bays perfect for relaxation. Although Umag’s history goes way back, only the Medieval architecture has been preserved. This is visible in the city walls, the Venetian villas, streets and old town that is now located on a peninsula, and was once an island. The Museum of the City is the oldest and the best preserved building in the west tower. In the city center there is a square where the Church of St. Mary from the 18th century is situated. Not so far away from Umag, in Savurdija, you can have a glance at the oldest lighthouse in Croatia that was built in 1818. 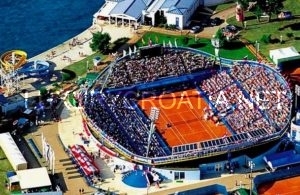 There is a number of manifestations in Umag, and the most famous might be the ATP Croatian Open Umag tennis tournament that takes place each year in July. Umag is not only about tennis however, there are a lot of options to engage in other sports such as footbal, golf and other. If you want to enjoy some music, you should visit the UmagoBlues music festival, and for the lover of electronic music, there is the Umagination festival that has been in Umag for a few years already. There is also a number of beaches in Umag with beautiful translucent blue sea, some of which have been awarded the Blue Flag award for the high sea quality and protection. Most of these beaches are rocky or pebbly and surrounded by pine trees that provide shadow, and the most famous are Katoro, Aurora, Kanegra and Laguna Stella Maris. Umag has one marina, the ACI Marina Umag, one of the best on the Adriatic coast, equipped with 475 berths and 40 dry berths, so there is a place to situate the nautical tourists as well. 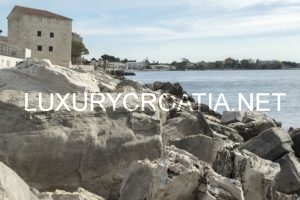 Umag’s great position can be used to take a day trip and explore the rest of the area, see cities like Pula or Rovinj, get a boat and visit Venice in Italy, or get a glance of the beautiful nature at the National Park Brijuni. For a couple of years now, there is an Istria Gourmet festival is maintained in Umag, representing the flavours and scents of Istria. It’s a wonderful chance to try some of the culinary expertise of Istria and selected Istrian produts, such as autochtonous wines, olive oils, truffles, prosciutto and cheese.